JANUARY 23 Spencer Wells, National Geographic Explorer-in-Residence and director of the Genographic Project, has spent the last seven years collecting DNA samples from people around the globe in order to create a genetically based map of human migration. See him present the project’s latest findings, and discover how scientific tools are helping to answer the question: Where did we come from? Roy Thomson Hall, 8 p.m., $39.50 to $59.50; call 416-872-4255 or click here to reserve. JANUARY 11 TO 22 The Toronto Symphony Orchestra continues its 90th season by commemorating an even older anniversary—that of Wolfgang Amadeus Mozart’s birth. The ensemble’s annual series of Mozart programming this year highlights two of the composer’s late-period masterworks—his Jupiter Symphony and Requiem—in separate concerts, along with other exemplary pieces and even a “Mozart’s Magnificent Voyage” show for young listeners. Audiences at the January 18, 19 and 22 performances of Requiem are in for an additional treat, as teenage prodigy Jan Lisiecki sits in with the orchestra for Mozart’s Piano Concerto no. 20. Roy Thomson Hall (January 22 at George Weston Recital Hall), $20 to $145; call 416-598-3375 or visit here for showtimes and to buy. DECEMBER 14, 16, 17, 18 & 19 Lift your spirits with two performances of the Messiah. At Roy Thomson Hall, the Toronto Symphony Orchestra performs Handel’s oratorio with the Toronto Mendelssohn Choir, $38 to $107. And for one show only, join in Tafelmusik Baroque Orchestra and Chamber Choir’s joyous Sing-Along Messiah at Massey Hall, $26 to $43; for both, visit here or call 416-872-4255 for a schedule and to buy. Follow along with the melodies made by Ted Dykstra and Richard Greenblatt, the actor-musicians behind the hit comedy Two Pianos Four Hands, a hilarious and poignant story about two lives transformed by piano teachers, lessons and competitions. The show’s recently extended run continues at the Panasonic Theatre. Listen to a Latin take on holiday music at Koerner Hall in A Salsa Christmas, performed by the Spanish Harlem Orchestra under the direction of world-renowned pianist, arranger and producer Oscar Hernández. Get a first look at The Power Plant’s two new exhibitions at their free opening reception. The gallery’s winter exhibits showcase reflections on poignant moments in cultural history by Canadian Stan Douglas and an international collective of young artists. There’s two more days of merriment after the jump! NOVEMBER 1 & DECEMBER 6 Photographer and filmmaker Mattias Klum guides you through some of the Earth’s natural wonders in Being There: On Expedition with National Geographic. Marvel at Klum’s still images and high-definition video from Botswana’s Okavango Delta and the rainforests of Southeast Asia. Then dive into the blue at Ocean Soul: Photographing the Underwater World for National Geographic and discover the vast, veiled world that exists beneath the waves. Brian Skerry leads you through the glacial waters of the North Atlantic and the coral reefs of the central Pacific. Roy Thomson Hall, 8 p.m., $39.50 to $59.50; visit here or call 416-872-4255 to purchase tickets. Immerse yourself in everything artistic at the Toronto International Art Fair, a.k.a. Art Toronto. See Andy Warhol’s 1979 BMW Art Car, a new site-specific installation by Kent Monkman, plus numerous other exhibiting galleries, presentations and discussions with artists, curators, and collectors. The show runs through to Monday at the Metro Toronto Convention Centre. Introduce yourself to dozens of new musical and theatrical acts at the Global Cabaret Festival, a weekend-long event at the Young Centre for the Performing Arts that celebrates songs, stories, and ideas with 150 musicians taking part in 44 performances. Explore the sometimes-chaotic interactions between nature and culture at upArt, the Gladstone Hotel’s annual contemporary art fair. The exhibition runs throughout the weekend with works by local, national, and international artists and collectives. Swing by Lavish&Squalor today as the shop opens its new antiques and vintage objets d’art section, and commemorates the occasion with a store-wide sale. Cocktails, snacks and live music round out your shopping experience. 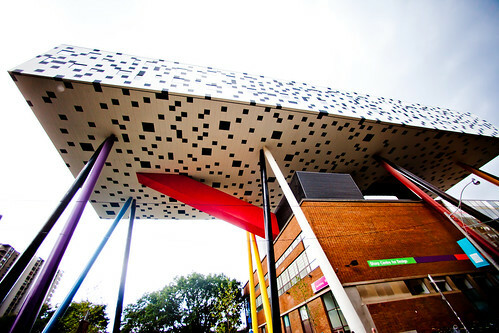 Happy 135th Birthday, OCAD University! The highly regarded school of art and design invites you to join its anniversary festivities, which today include an open house, digital game-making event and an exhibition of acclaimed works by OCADU community members. Bright colours, spectacular dances and a musical extravaganza reveal India’s cultural diversity in Bharati, the Wonder That is India. Dancers, actors, singers, acrobats, musicians and martial artists are all part of the show at the Sony Centre for the Performing Arts. Take the whole family down the yellow brick road, which, strangely enough, leads to Roy Thomson Hall and Oz with Orchestra. Watch the classic film The Wizard of Oz on a giant screen with live accompaniment provided by the Toronto Symphony Orchestra. The NFL moves north of the border (for a day) with the Bills in Toronto Series coming to the Rogers Centre. The Buffalo Bills look to keep their winning season going as they take on the Washington Redskins. Rare books, maps, prints, and manuscripts from around the world are on display at the Toronto International Antiquarian Book Fair. Peruse limited edition, signed volumes, and unusual books of all kinds at the Metro Toronto Convention Centre. As it happens, there are a slew of Halloween-centric activities happening this weekend around the city, too. Check out those bloodcurdling events here. If you dare. OCTOBER 28 The fabulous Liza Minnelli brings her theatrical élan to Toronto for a one-night-only exclusive. Her lively show and memorable voice is guaranteed to dazzle. Roy Thomson Hall, 8 p.m., $59.50 to $199.50; call 416-872-4255 or visit here to buy. 8 p.m., Sunday 3 p.m., $20 to $105; call 416-872-4255 or visit here for tickets. OCTOBER 23 Call your banners, fifes and drums and commemorate an important part of Canada’s proud history at the 22nd annual Massed Military Band Spectacular. Produced by the Royal Canadian Military Institute, this tribute concert features “sounds triumphant”—the timbres of horns and pipes resonate in rousing tunes like The Dambusters and Braes of Mar. The performance also remembers the Crimean and Korean wars with pieces from their respective eras. Military artifacts and regalia are on display outside the auditorium before showtime. Roy Thomson Hall, 2 p.m., $32.50 to $74.50; call 416-872-4255 or visit here to buy. SEPTEMBER 22 & 24 The Toronto Symphony Orchestra celebrates the launch of its 90th season with a special appearance by Christopher Plummer. The legendary Canadian actor delivers a resounding narration of Shakespearean classics with musical accompaniment, including renditions of Tchaikovsky’s Romeo and Juliet Fantasy Overture, and the world premiere of Larysa Kuzmenko’s composition Behold the Night, which incorporates passages from A Midsummer Night’s Dream. Roy Thomson Hall, 7:30 p.m., $49 to $179; call 416-593-4828 or check here for tickets. Start the weekend on a high note as the Queen of Soul, Aretha Franklin, opens the TD Toronto Jazz Festival with a free show at David Pecaut Square. The festival continues until July 3, and promises performances by the Dave Brubeck Quartet, Branford Marsalis, and even hip-hop outfit The Roots. One of the largest GLBT celebrations in the world, Toronto’s Pride Week begins this weekend with events throughout the city. Tonight the Gladstone Hotel hosts a Gay-Straight Alliance Dance Party, with DJs including Cosmic Cat and Broken Social Scene’s Brendan Canning, spinning tunes. The festival culminates with the annual Pride parade on July 3. Cheer on all the competitors at the 23rd Annual Toronto International Dragon Boat Race Festival. The two-day event at Centre Island offers multicultural food and entertainment, plus more than 180 teams paddling teams competing for glory. Calling all cycling enthusiasts! Join the fun at Mountain Equipment Co-op’s Bike Fest in the Distillery Historic District, featuring clinics and seminars, demonstrations, a scavenger ride and even live local bands. Sunday: Les Chiclettes and other francophone artists perform at Franco-Fete. Round out the weekend by celebrating Canada’s other official culture at Harbourfront Centre’s Franco-Fete. The city’s only francophone festival presents a bevy of family-friendly performances, culinary demonstrations and much more. Très bien! The Toronto Zoo marks the occasion of the International Indian Film Academy Awards being held downtown with it’s own Bollywood party. The festivities include music and dancing for children, as well as storytelling, henna tattoos and more. Welcome the start of summer with a 1920s-style garden party at Spadina Museum: Historic House and Gardens. Guests can marvel at the mansion’s decor—recently restored to its Jazz Age heyday—dance to jazz rhythms, enjoy period-appropriate refreshments, and even solve a murder mystery.